The ebook is, for lack of a better description, a long, personal love letter to Kiss. Because of his background, Epting delivers the letter from the unique perspective of an informed insider…not as someone with an ax to grind. If you’ve read the recent Kiss biographies (I certainly have), you’ll find interesting stories about Kiss from Gene Simmons, Peter Criss, and Ace Frehley. (Paul Stanley still hasn’t released a book.) Each of these biographies offers a view of Kiss that is both revealing and disappointing. It’s sad to hear about infighting and drug abuse, especially from creative people who you admire. If you are a fan, then Epting may have the upbeat, positive Kiss-story that you want to read. At $2.99 on Amazon for the Kindle, you may find that it’s the right amount of information and a price that may soon become the standard for ebooks. As a marketer and an ebook developer, I was also interested in the story behind “All I Need to Know I Learned from Kiss.” Specifically, I wanted to know how a writer like Epting — an author of 20 books — made the transition from print to digital. Epting was kind enough to participate in an email exchange that resulted in this interview. BUDDY SCALERA: So, in your official author’s voice, can you give me the overview of your ebook? CHRIS EPTING: The overview of the book is pretty simple. I grew up a big fan of the band KISS in the 1970s. They’ve always kind of stuck with me throughout the years and so when I got the chance to know them as a journalist the last couple of years, it just struck me how much their music has meant to me. As well, my teenage son is also a big fan of the band, and I realize it’s almost like cheering for the same baseball team that you did when you were a kid. You have so much emotion invested in a favorite band that sometimes you realize that that band helps shape your view of the world. One day while interviewing all four members of KISS last summer I got inspired and thought it was just time to put my thoughts down about how this band has affected me. It goes way beyond the music as it turns out. This was and is a band that I think some good life lessons can be drawn from. So this book describes my love of KISS as a youngster and traces that evolution all the way to present day. Was this intended as an ebook? Or was it a long essay or blog post that became an ebook? Talk to me about the original idea and how it evolved into an ebook. It was actually intended as an e-book. I spoke with Nell Minow at Miniver Press in regards to some ideas to contribute. She’s been been some very interesting pop culture-related titles and I thought this would it in. In my head I knew that this KISS book was not going to be long form like my usual books. I knew it would be succinct and very specific and so the length appealed to the publisher. I knew I had about 20,000 words to play with and so I just sat down and started to write. It came very quickly for me because the memories are so vivid and my passion for the band is still very strong. That my son has had a chance to meet the guys and also appreciate the music gave this idea a special layer for me because my son and I are extremely close and we have bonded over music for many years. NOTE FROM BUDDY: An average book may run between 40,000 – 70,000 words. Typical novels run around 55,000-60,000 words. You’ve published physical books with a few different publishers. 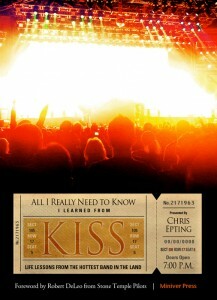 Why go with an ebook for this Kiss book? I was always curious about e-books because on the one hand, while I still like physical books personally, I see the way the industry is going. I thought this might be a chance for me to get my feet wet and begin learning about how to create and market a book that only exists digitally. It has been a lot of fun so far experimenting with various marketing ideas and I have enjoyed the experience. The book has also performed well and interestingly, because there is no hard cost associated with it, the royalty a writer receives is almost identical to what you would get from a trade paperback book that sells for much more. That said, at some point down the line I would like to examine having this book published in print form by adding some more content to it. After all, I know a lot of KISS fans are collectors and would probably enjoy a book full of unique stories and rare photos. I know that I would. I discovered your book from some sort of free promotion. Not even sure where I saw it, but as a Kiss fan, I had to click on the link. Can you talk about how you promoted your book? The publisher had some promotional ideas including a weekend where it was free for download. In terms of how we marketed the book and promoted it, it’s not that different than promoting a print book. I did what is called a satellite radio tour where I spoke to several dozen radio stations around the country about the book and then a press release was sent to various music publications and websites, many of which ran some sort of story on the book or interviewed me. E-books are still fairly new and I’m sure that soon there will be many new ways to help spread the word but for right now there are lots of opportunities to make specific audiences aware of your book. Thankfully, KISS fans eagerly look for new things to read about the band, I’m the same way, and I’ve received really good response so far about the book. Other than word count, were there any differences writing an ebook from a print book? Other than word count there really were not many differences. A story is still a story with a beginning, middle and end. It still just comes down to putting words into place into something that hopefully conveys a compelling narrative. So marketing has definitely changed from print to digital in so many ways. You noted that your book was a free download initially (where I discovered it). Now it is $2.99. Is the book selling? Is $2.99 the right price or do you anticipate market adjustments for books like this? The book does seem to be selling well. Obviously, sales are more reactive when i do some press for it or when the publisher does some sort of targeted email promotion etc. I think 2.99 seems a good price because for about the cost of a cup of coffee you are getting a story that is personal and hopefully unique. Time will tell whether or not the price will be adjusted but I would imagine that there will be promotional periods were perhaps it will be just $.99 or something like that. There’s a lot of learning still being done in the world of marketing e-books, lots of trial and error and a ton of experimentation. Since many of my readers are marketers, let’s talk about marketing a little more. You have published print books and now you have an ebook. How do you see marketing and promotion evolving in publishing? In my opinion, as one that also has an advertising background, marketing and promotion are the lifeblood of the publishing industry. You can write the greatest book in the world, but if people don’t know about it it’s not going to make much difference. While it is true that many newspapers that used to review books are now gone, there are far more outlets online that review books and other pieces of art for very specific audiences. So I’m actually very positive about the state of things today. In my case, writing a book about KISS, we were able to identify many relevant outlets including fan sites and message boards where the book was embraced right out of the gate. As far as how the marketing and promotion will evolve, suffice to say social networking becomes one of the real keys to the game in terms of creating audiences and also finding existing audiences and tapping into their mindset and interest. You mentioned the possibility of your ebook going print someday. As an author, I’ve thought about this a lot as well, since you can’t do a book signing with ebooks. How do you think print and e will work in the future? It’s true you can’t do signings with the books but one idea I’ve had to counteract that is to have the covers of my e-books printed and made available for signatures. The right kind of cover can serve as interesting piece of art and while it’s not a signed book, it is a souvenir related to the book. I have some book signings coming up for my printed titles and I’m thinking of bringing along some of the kiss covers in case anyone there is interested in those. As to how print and e-books will work together in the future, I really do look at them as separate entities. Marketing printed books has many traditional channels in place but I think the sky is the limit for how you market an e-book. As long as you have a computer, the world is your oyster. Last, but certainly not least, can you talk about some of the things you have in the works and where people can find them? Currently I write many articles for AOL music and I’m working on several new books including an “as told to” title featuring a very famous guitarist whose name I am not quite able to reveal just yet. But I will soon. I have an author’s page on Facebook and an author’s website which is simply ChrisEpting.com. This entry was posted in amazon, Authors, books, content, creativity, ebooks, ereaders, Marketing, new media and tagged authors, digital publishing, ebooks, Kiss, Marketing, publishing, strategy by Buddy_Scalera. Bookmark the permalink.